Jaseng treatment helps bone and nerves to regenerate, by boosting the self-healing power of the body. We treat the cause of your spine/joint problems. After the Korean War, there were many injured and sick people. Proper doctors were rare to find. There was a skillful doctor who could practice both Western and Korean medicine. He became famous. Patients with advanced diseases were eager to be treated by him. This doctor made medical house calls on his bicycle and didn’t mind going as far as 15.7km to visit them. He practiced surgical techniques to incise and stitch affected areas. He also applied acupuncture and prescribed herbal medicine to his patients. The doctor’s son, who was 6 at the time, grew up following his father to house calls and watching him treat patients. For a boy like him, pretending to apply acupuncture with matchsticks was just like playing house. One day, the doctor’s spine was fractured from slipping on the stairs. This turned into spinal tuberculosis. As a result, two segments of his spinal bones melted and he was bedridden for 6 years. However, the patients’ demand for this doctor was unending, so the doctor treated them from bed. By watching his father, the son decided to become a Korean medicine doctor so that he could treat his father himself. However this dream didn’t come true. The son later succeeded and developed the method that was in ‘Chung Pa Hum Bang Yo Gul’ and the acupuncture techniques that he directly learned from his father. Eventually, he invented unique prescriptions and treatment methods to treat spinal disorders. He changed the paradigm within the medical society, where surgery was the only option for treating spinal disorders, and became a famous Korean medicine doctor who treated discs with traditional Korean medicine. 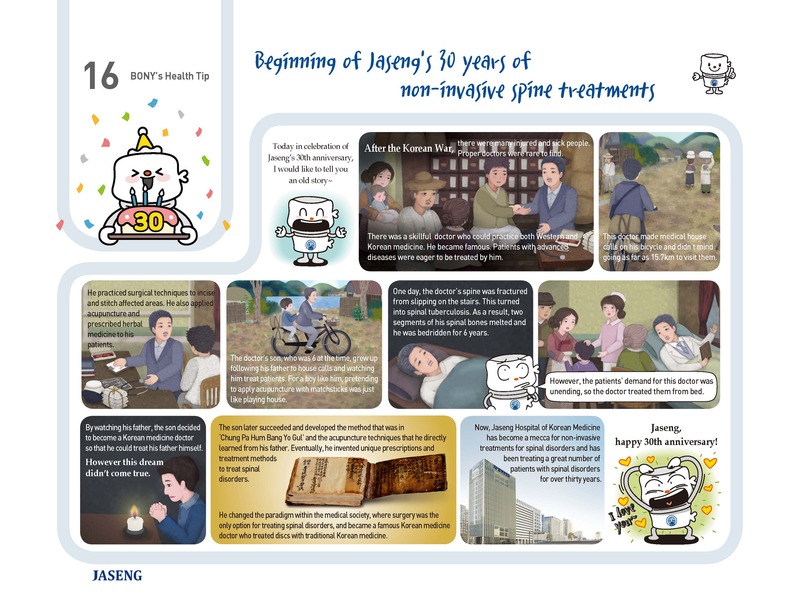 Now, Jaseng Hospital of Korean Medicine has become a mecca for non-invasive treatments for spinal disorders and has been treating a great number of patients with spinal disorders for over thirty years. Everything You Need To Know About Chuna Manual Therapy!